To fulfill the promise of animals, Capital Humane Society shelters animals, protects animals, and teaches compassion and respect. $50 spays or neuters a pet. "It is a common occurrence for people to stop me when I am out in the public and tell me about the pets they have adopted from Capital Humane Society. They speak about how the pet has impacted their life. Perhaps they were depressed and the pet helped them emerge from that. How the pet helped a shy child become more engaged with others. How the pet pulled a family closer together because it became a point of focus they all cared about. Some stories are very compelling. A military veteran who was in a deep and dark place and the adopted pet gave them something else to focus on, something that they could interact with and not be judged by. The pet that gave a senior citizen living on their own a reason to get up every day. 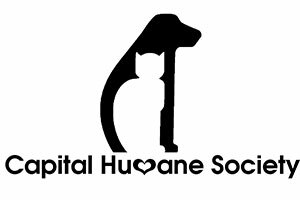 Capital Humane Society is as much a human service organization as it truly is an animal welfare organization. These stories make me proud of what my staff accomplishes and what Capital Humane Society represents. It gives me the drive to do the work I do."